Teach your students the important aspects of blood pressure through hands-on experience. 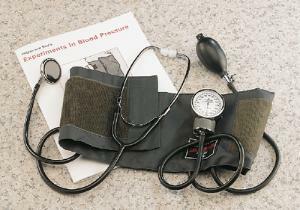 Kit includes pocket aneroid sphygmomanometer with Velcro® cuff and vinyl pouch, a Bowles stethoscope and manual, “Experiments in Blood Pressure”. Topics for discussion include physiological theory and medical conditions, hypertension and effects of exercise, caffeine, pain and standing on blood pressure.